This course prepares candidates for the rapid reporting part of the exam. It is run on individual 21.5inch imacs running Horos (Osirix equivalent). This course arose as a request from candidates attending my other courses, trying to achieve the high scores many of our trainees achieve. This course is very different from other rapid reporting courses. You will have the opportunity to do a pre-course test and receive an analysis of your individual performance categorised by undercalling, overcalling or other deficiencies. On the day the course is designed to explain to you the marking of the exam, the strategy of the examiners, your strategy in response and frankly to correct the errors accumulated by poor training, course or online advice that has led to overcalling or packs that have been setting the wrong standard. If anything the course increases your confidence in calling normal normal, improving your speed of interpretation and decision making, and how to deal with uncertainty. Candidates are encouraged to ask questions about concerns they have with individual cases or their exam strategy. The successful methodology of the course is validated by multiple candidates stating that they felt the course set the right standard for the exam. In particular candidates that had previously passed every section of the exam except the rapids felt the course made the difference in their preparation and led to them passing comforably. Approximately half the day is spent on targeted review of imaging areas, body part by body part, to acquaint candidates with approaches for every area. In the afternoon, the experience is consolidated with two full exams and then there is a further post course exam. Overall candidates will see >300 cases, however, the course is structured to ensure that there is a balance between establishing the exam standard, gaining confidence in normality, and being aware of pitfall abnormals without the latter causing overcalling. Includes light breakfast, excellent hot lunch, coffee/tea throughout day. Premier central London venue (De Vere West One). Much like the written course this rapid reporting course arose as a direct request of many candidates attending the 2 day Viva and the one day Written Courses and desiring more preparatory teaching, in the same style as the other Grayscale courses, for the Rapid Reporting part of the exam. The 2 day Viva Course already includes some rapid reporting pre-course materials, but this dedicated course takes it a step further. As with the Written course there is no overlap between this course and the Original 2 day Course. The course can be taken with or without the 2-day Viva Course and/or the Written course. If you are also taking the 2 viva day course it does not matter if you take this course before or after the viva course. As is the case with the viva course this course was set up to address deficiencies that trainees experience with the array of existing courses. Most courses remain simply assessment courses. You complete an exam, you may get a few words of advice, and you move on. The first problem is that you do not get taught. The second problem is that the advice you may get is of variable accuracy and quality. Finally, its not personalised to you. Certainly there are many good courses that provide the opportunity for reviewing rapid reporting "packs". Many departments also have a collection of such packs. We would encourage trainees to avail themselves of as many of these packs as they can. The problem is that there is such variability of these packs. That is because they are often put together by junior members of staff, or others, trying to prove how smart they are. You see a film that looks normal to you, some obscure angle is mentioned that you didn't know proving it was abnormal, and there is the proof perhaps on a follow-up MRI. You end up confused. You do varying packs. Your scores oscillate from fail to pass, then you start to overcall and before you know it every foot has a lisfranc, every chest x-ray posterior shoulder dislocations and every skull film has Luckenshadl! Put together the stress of feeling you have to get that all important "27" and it is understandable why so many people find this section stressful and underperform. It is often stated that the rapid reporting is simply a test of your normal reporting of plain films. Nothing is further from the truth! The rapid reporting is a specific test. It requires a specific approach for every film. It requires a balance of knowing what to look for and a confidence that normal is normal. It also requires a clear strategy of this section of the exam. The strategy includes you understanding on a personal basis whether you overcall or undercall, how the exam varies from set to set, and how you can use mathematics to your advantage. Using these approaches 3 of our 6 trainees in a recent year scored 8 on this section (all passed all sections). That is a perfect score, a huge advantage going into the remainder of the exam. You will not do non-stop repeated exam packs on the day. This approach does not afford you time to assess your performance and to learn. If you are already good then you will gain little. If you are poor you will be disheartened. So what is our approach? 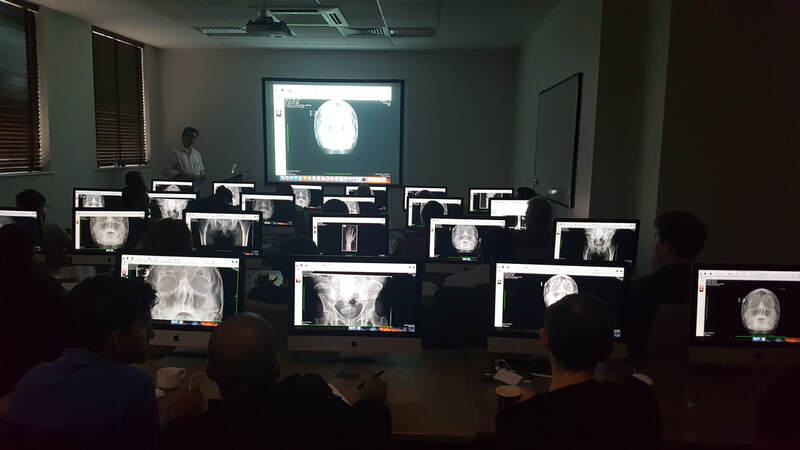 Instead you will receive a DICOM exam to review online prior to the course. We will mark this and give you an analysis of your under-reporting/overcall performance. On the day we will start with an analysis of how the exam is marked, how candidates lose marks, the exam mathematics, how to score high, the general approach and review some data on exam variance. We address what to do in cases of uncertainty. Then we will move into reviewing exam films, body part by body part. The idea will be to give you a specific approach for every film, what to look for and where. At the same time we will give you guidance on how to feel confident on normal films. We mix normals and abnormals and we will engage you throughout. You get to discuss why you thought a film was abnormal or normal and be guided as to whether you should call it in the exam. At the end of each body part we rapidly show additional abnormal films that cause confusion. We train you on improving your speed to increase your confidence in normality. This way we will see many more films than you could see by just doing a few packs and running through the answers. In the afternoon we reinforce the learning by doing two further exam packs. After the course we will give you another set for you to review at home for you to self-mark and assess your progress.